A Louisiana man is accused of shooting a cashier and then killing the police officer who was sent to investigate, authorities said Monday. Ian Paul Howard, 28, of Lafayette also is accused of wounding a second person and attempting to kill a second police officer, officials said. Howard was arrested Sunday on several charges including first-degree murder of a police officer, Louisiana State Police said in a news release. First-degree murder charges have only two possible sentences: life in prison or death. Lafayette police spokesman Cpl. 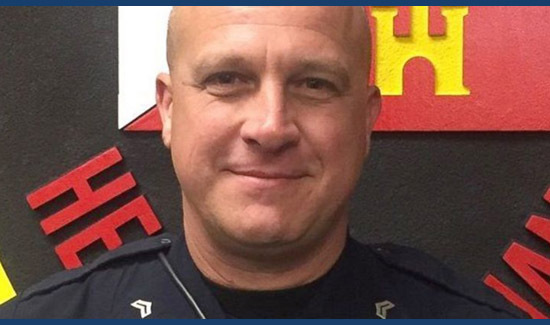 Karl Ratcliff identified the slain officer as Cpl. Michael Paul Middlebrook, a nine-year patrol veteran. He’s survived by his wife, their 3-year-old daughter, two stepdaughters and his parents. Neither Ratliff nor Master Trooper Brooks David, a state police spokesman, immediately responded to a query about whether Howard has a previous police record. Howard’s father, Edwin Howard, said “the family is in deepest shock” and had no comment about the allegations against his son. State police said Middlebrook was killed late Sunday while answering a call about a shooting at a Big Boy convenience store in Lafayette, a city-parish of about 125,000, about 120 miles (190 kilometers) west of New Orleans. The Big Boy sits in front of a federally subsidized apartment complex in a neighborhood of stores and apartments. David said Howard started a shootout and ran, but was quickly arrested by Lafayette police. He said Howard is accused of trying to kill a second officer, who was not wounded, and of shooting two people in the store. A witness, Avery Cross, 29, of Lafayette, told The Advocate that the shootout took place inside the store. He said that apparently nobody realized the gunman who had shot a cashier was still inside when the officer entered the store and was killed. Cross said he’d gone to the 24-hour store late Sunday, only to find it locked. An employee came to the door and told him a cashier had been shot, pointing out bullet holes in the window, Cross said. He said two officers showed up and one went inside, apparently unaware that the gunman was inside. “So when he walked in, the guy popped out and started shooting,” Cross said. He said he heard at least five shots, then the gunman then came out and fired into the air, yelling for people to back up. I am very saddened to hear of this. God bless his family.